I try hard to give each kitten equal time on the blog, but it seems Mr Ferris has not had his fair share. So here you go, little man. Here's your fifteen minutes of fame. Ready? One two three,,,,,now SHINE! Very nice. Now show them your whiskers. OK, now tilt your head. How's a little sweetie to get attention when Ambrose is climbing candlabras and getting stuck in vases? Very nice, Ferris. You are a cutie-patootie! Skinny chap, he is! But I love his expression in photo 3, and it shows off his white tie and shoes so nicely. What a cutie! And those whiskers - they seem so big for a tiny guy like him! I love those white whiskers of his! I especially like the tiny little ones around his mouth, want to kiss them!!!! Ferris I think you have a great career in kitty modeling ahead of you! Good job! Lookee them white toes! I always call black cats with white toes "Faucet feet" because the toes make me think of these old-fashioned porcelain faucet knobs. What cute little bendy eyebrows! Mr Ferris, you are beautiful! And you've got posing down to an art form. You forever-family-to-be is sure to be impressed. We're back home with pain meds for my furbaby, looks like nothing serious (well nothing extra anyway, he's already got a number of issues). Fingers crossed that he recovers quickly. Please tell me this sweet bundle of cuteness already has a home lined up! Mr. Ferris is a sweetie and he does shine!!! I love him!!! I love his whiskers so, so much. I'd love to see some shots of him and Emory playing together. And is that Ambrose hiding in the back, hoping for some extra camera time? That boy likes attention! Oh, the tilted head should be part of the future A-E photocard set. There has to be one! omg! 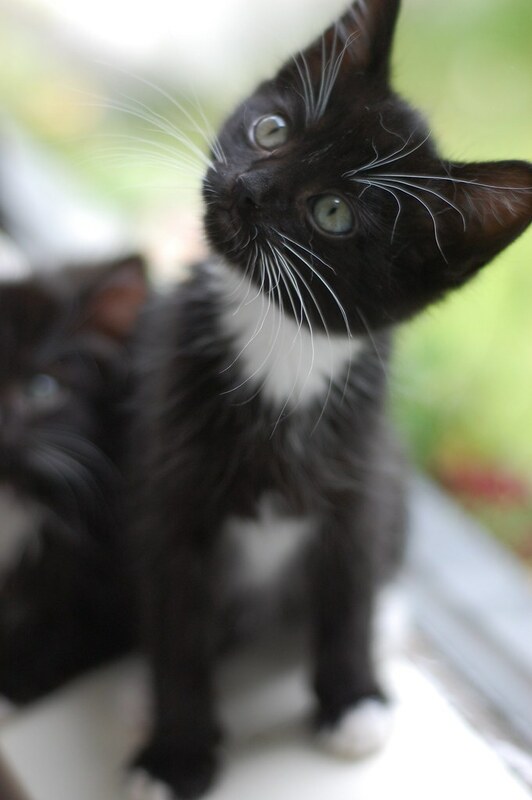 White whiskers on a black face. Just kill me will you! So cute. Squeeze, smooch, smooch. 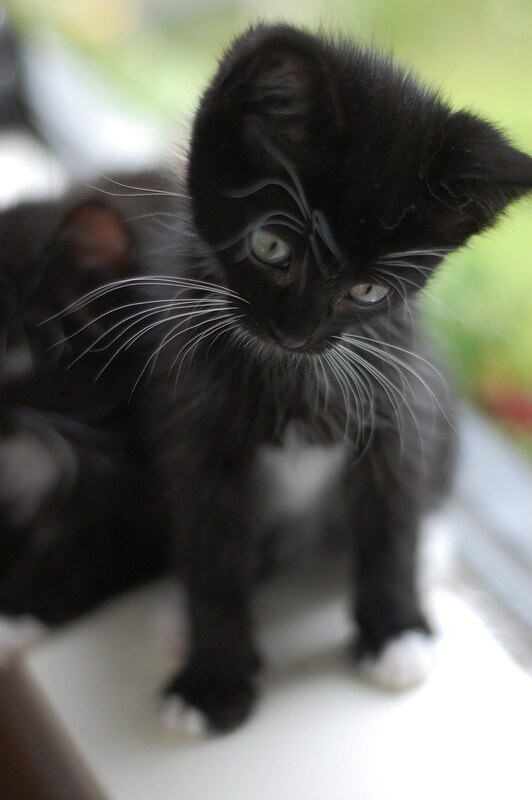 That is one mighty fine set of whiskers for such a little guy. Well done Ferris, well done! I guess he just wants his solo time instead of being a member of the horde. You are such a lovely lovable baby...so handsome little man...lovely lovely whiskers and socks!! I'm dazzled! Magnificat whiskers too, little boy! 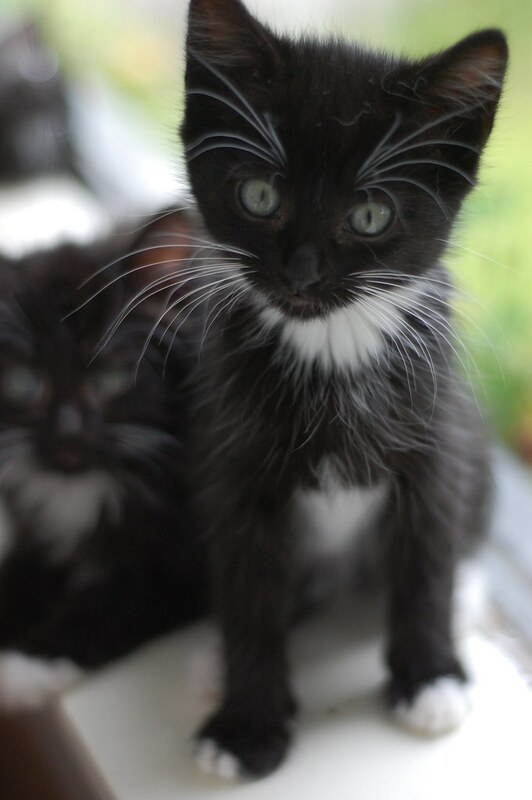 Oh I just love Tuxie kittehs! They are so cute!! Ferris, I want to take you home but Sylvester might not be amused. love his right paw! white toe tips!